Authorities found the cellphone of a 21-year-old Virginia woman found dead in her car, and they say they've recovered critical text messages and phone calls made just before the killing. Heather Ciccone was found shot to death in her car Sunday night. Spotsylvania County sheriff's deputies say they're getting closer to making an arrest in her killing. Ciccone's parents say she had received a call at around 9:30 p.m. Sunday night and told them a friend's car had broken down, her mother told News4. Ciccone left her family's house in Spotsylvania around that time. It was the last time they saw her alive. Around 11 p.m. Sunday, a resident in the 10300 block of Piney Branch Road called police and said an unfamiliar car was parked in his driveway, police said. The car was Ciccone's, and her body was found inside. 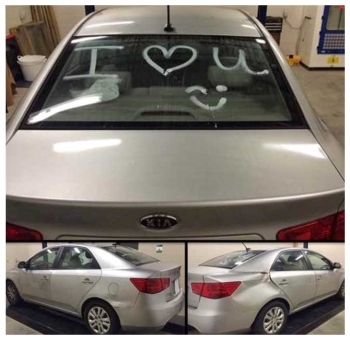 The Spotsylvania County Sheriff's Office released photos Wednesday of Ciccone's car, a silver Kia that had "I [heart] you" written in paint on the back window, with a winking smiley face. Authorities are asking anyone who saw her car between 10 and 11 p.m. Sunday to contact them at 800-928-5822 or 540-582-5822, by sending a text message with SEE911 to CRIMES or by visiting www.spotsylvaniacrimesolvers.org.